Joseph Robinette Biden, Jr., the vice president of the United States of America who remains in "good standing" in the structures of the counterfeit church of conciliarism despite his support for the chemical and surgical assassination of children under cover of the civil law and his promotion of "special rights" for those engaged in perverse behavior in violation of the Sixth and Ninth Commandments, paid a "personal" visit to Joseph Ratzinger/Benedict XVI at the Apostolic Palace in the Vatican six days ago, Friday, June 3, 2011. No statement was issued by his office. No statement was issued by the false "pontiff's" spinmeister, "Father" Federico Lombardi, S.J. Ah, yes, a discreet silence has been maintained by both sides. The conciliar "pontiff" and his conciliar "cardinals" and "bishops" howled and bayed at the moon in protest to demonstrate their "solidarity" with adherents of the Talmud, who have exploited the events of World War II to effect an abandonment of Catholic teaching concerning Judaism that began during the false "pontificate" of Angelo Roncalli/John XXIII and culminated in the issuance of Nostra Aetate by the "Second" Vatican Council on October 28, 1965. (See Those Who Deny The Holocaust, Recognize and Capitulate, As We Forgive Not Those Who Trespass Against Us, Yes, Sir, Master Scribe, Disciples of Caiphas, Under The Bus, No Crime Is Worse Than Deicide, Nothing New Under the Conciliar Sun, "And They That Passed By Blasphemed Him".) Ratzinger/Benedict personally apologized to Talmudists for the offense that had been given to them. All manner of purely gratuitous ceremonies were scheduled to denounce Bishop Williamson, including one by Sean "Cardinal" O'Malley and Roger "Cardinal" Mahony. This theater of the conciliar absurd played out on a matter of secular history that binds the consciences of no member of the Catholic Church. It was just a few months later, on Holy Saturday, April 11, 2009, that "Archbishop" Robert Zollitsch, the president of the conference of conciliar bishops in the Federal Republic of Germany, denied in a television interview that Our Lord died on the wood of the Holy Cross in atonement for our sins without a word of "papal" rebuke. Not a word. Ratzinger/Benedict himself is treated with respect, reverence and awe by many "conservative" and traditionally-minded Catholics in the conciliar structures even though he defects from the Faith in numerous ways. Some of these people know that this is so, preferring, though, to keep their silence because they believe that they are making "progress" "within the structures," a belief that is purely delusional. As I have noted, there's a whole lot to keep silence about as the false "pontiff" esteems the symbols of false religions, praises false ecumenism, rejects what he calls "the theology of the return," denies the nature of dogmatic truth and the nature of the Divine Constitution of Holy Mother Church, gives joint "blessings" with the "ministers" of false religions, calls places of false worship as "sacred" and "jewels that stand out on the face of the earth," and embraces condemned propositions such as religious liberty and separation of Church and State and places into the fog of ambiguity and uncertainty the Catholic doctrine on Purgatory and attempts to make the Fathers and the Doctors of the Church as false witnesses in behalf of conciliarism (see From Sharp Focus to Fuzziness). That's a whole of offense given to God about which one must choose to be silent. Both Biden and Ratzinger/Benedict have expelled themselves from the bosom of Holy Mother Church. It's always nice when apostates get together for a friendly confab in private. Look, why should "conservative" and traditionally-minded Catholics in the conciliar structures expect their "pope" to speak out about Joseph Robinette Biden, Jr.'s, open support for grave evils under cover of the civil law when they are silent about what are, considered in the objective order of things, grave evils committed by him, Ratzinger/Benedict, that offend God and hinders the temporal and eternal good of souls by distorting Catholic teaching with blasphemies, sacrileges, heresies, errors and falsehoods? Crimes against God are graver in the hierarchy of evils that crimes against men. It is absurd and indeed quite blasphemous in and of itself to assert that a "pope" is "pro-life" when he himself undermines the good of souls and thus the right ordering of nations by flagrantly violating the First and Second Commandments in the name of "unity" and "brotherhood." The same applies to the notion of Fraternity which they found on the love of common interest or, beyond all philosophies and religions, on the mere notion of humanity, thus embracing with an equal love and tolerance all human beings and their miseries, whether these are intellectual, moral, or physical and temporal. But Catholic doctrine tells us that the primary duty of charity does not lie in the toleration of false ideas, however sincere they may be, nor in the theoretical or practical indifference towards the errors and vices in which we see our brethren plunged, but in the zeal for their intellectual and moral improvement as well as for their material well-being. Catholic doctrine further tells us that love for our neighbor flows from our love for God, Who is Father to all, and goal of the whole human family; and in Jesus Christ whose members we are, to the point that in doing good to others we are doing good to Jesus Christ Himself. Any other kind of love is sheer illusion, sterile and fleeting. Oh, yes, some will protest that what they think is the Catholic Church needs to give Biden more "time" to reflect upon his misrepresentation of Church teaching concerning the absolute inviolability of innocent human life, that "patience" is necessary," that more "dialogue" should be tried before any disciplinary measures could be imposed upon this man. Nice try. This is a nice try except for the nasty, inconvenient little fact that Biden switched his position from pro-life to pro-death soon after the decision of the Supreme Court of the United States of America in the cases of Roe v. Wade and Doe v. Bolton on Monday, January 22, 1973, meaning that he knew what was right for the first thirty years of his life. He even took a "pro-life" position when running for the United States Senate in the State of Delaware in 1972. More "time"" After all of the innocent blood that has been shed? Are you serious? The man who demagogued against Robert Bork? Are you serious? Please see Lest We Forget, Memo to Joseph Biden and Nancy Pelosi and Their Conciliar Enablers, Fact and Fiction and Fallacies Galore if you are serious. Yes, that's the dark haired Biden, using a comb over, to the false "pontiff's" left, our right. Senator Howard Baker is in the middle. Wojtyla/John Paul II certainly knew how to reprimand public officials. He did so very boldly in the presence of the Soviet stooge named Wojciech Witold Jaruzelski, installed by the Soviets as their proxy dictator when he became Prime Minister of the "People's Republic of Poland on February 11, 1981 (supplementing that title when he became the First Secretary of the Central Committee of the Polish United Workers Party, the Polish Communist Party, in other words) October 18, 1981, at Belvedere Palace in Warsaw Poland, on June 17, 1983. 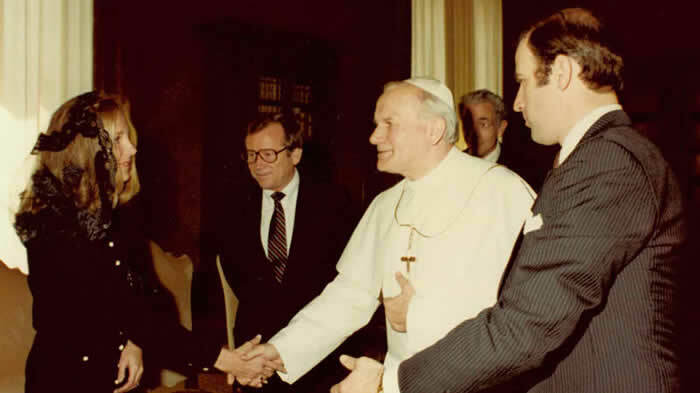 Wojtyla/John Paul II forcefully condemned Jaruzelski's imposition of martial law on December 13, 1981, and the subsequent crackdown on Solidarity and its founder, Lech Walesa. Live television broadcasts showed that Jaruzelski's knew buckled and were knocking together in nervous tremors as the Polish-born conciliar "pontiff" thunderously condemned Jaruzelski's actions as they stood side-by-side before the microphones and cameras. The Jesuit trained Jaruzelski, who turns eighty-eight years of age next month, admitted to Barbara Walters after the collapse of the overt phase of Communism in Poland in 1989 that he was scared to death, knowing that the "pope" was correct to upbraid him. At least he had something resembling a conscience, distinguishing himself from the arrogant, foul-mouthed Joseph Robinette Biden, Jr. (When "Boys Will Be Boys" They Grow Up to Be Men Like Joe Biden). Wojtyla/John Paul II even used a private meeting on April 1, 1987, with Chilean military president Agosto Pinochet, who had imposed a military dictatorship upon the overthrow of the first elected Communist leader of any free country in the world, Salvador Allende, on September 11, 1973, to push for for free elections and even called upon Pinochet to resign, thus prompting Pinochet to schedule such elections, departing from office on March 11, 1990. Although perhaps the subject of a different article at some point in the near future, "Archbishop" Mario Conti knows that he can thumb his nose in the face of the conciliar "pontiff" without a word of rebuke. The devil stands ready to use Conti's proclamation to evoke sympathy from traditionally-minded Catholic for the "pope" who is so disrespected even though many, although not all, of them keep their mouths absolutely shut when he esteems the symbols of false religions and engages in joint "blessings" with the non-ordained "clergy" of false religions. In like manner, Biden, who was probably reprimanded by the currently governing false "pontiff" in private when they met seven days ago now. Apologists for the false "pontiff" are saying that this he is sparing Biden public humiliation in order to give him more time to "reflect" on his position, will continue to thumb his nose at Ratzinger/Benedict as this foul-mouthed low-life who has been indemnified repeatedly by the Oblates of Saint Francis de Sales, under whose sponsorship he spoke at the then named Allentown College of Saint Francis de Sales in Center Valley, Pennsylvania, in the Spring 1980 Semester when I was teaching there (I did ask a rather pointed question of Biden about his support for baby-killing, prompting him to give a long-winded, evasive answer). will continue his arrogant public support for one grave moral evil after another under cover of the civil law. Those who seek to indemnify the "good 'pope'" ought to consider the fact that he has forced one of his "conservative" "bishops," Joseph Martino of Scranton, Pennsylvania, to walk the conciliar gang plank after he, "Bishop" Martino, was termed "divisive" for his criticism of the pro-abortion Vice President of the United States of America, Joseph Robinette Biden, Jr., a Catholic who was born in Scranton and who remains in perfectly "good standing" in the Diocese of Wilmington, Delaware, and for his trying to keep supporters of perversity from speaking on the campuses of once Catholic colleges within the boundaries of his diocese. bad things out of his diocese. "Bishop" Martino also threatened to deny what purports, albeit falsely, Holy Communion to United States Senator Robert Casey (D-Pennsylvania) for his floor vote in favor of the confirmation of the pro-abortion Catholic Kathleen Sebelius, the former Governor of the State of Kansas who profited from political donations made to her by the late late-term baby-killer George Tiller, as Secretary of the United States Department of Health and Human Services. Last year, he arrived unannounced at a parish whose members were discussing a document on political responsibility recently issued by the U.S. Conference of Catholic Bishops. "Bishop" Martino, who cited "fatigue" and "insomnia" caused by the controversies engendered by his strict stand against pro-aborts in public life, was, unfortunately, little better than his predecessor, James Clifford Timlin, in dealing with perverted members of his clergy, and he remains a thorough conciliarist supportive of the conciliar agenda, including the Protestant and Masonic Novus Ordo service. It is rather telling, however, that he was, in effect, shown the way to the gang plank on the Pirate Ship Ratzinger for good faith efforts to try to discipline wayward Catholics and to defend at least some truths of the Holy Faith with vigor no matter the criticism that he received for doing so. Just another ordinary day in the life of the counterfeit church of conciliarism. Ah, yes, speaking of the "happy" "bishop," Timothy Dolan, who once praised the work of the pro-perversity, pro-abortion Anti-Defamation League of B'Nai Brith, the conciliar "archbishop" of New York has offered criticism of Biden. In doing so, however, "Archbishop" Dolan claimed that the inviolability of innocent human life in the womb is a "civil rights" issue, not a matter of Catholic doctrine. Oy. While the fact that human life begins at conception of a matter of scientific truth and while one can come, as Hippocrates, Juvenal and Ovid and other pagans of yore did, to the conclusion that it is wrong to take innocent human life in the womb, yes, Timothy Dolan, this is a matter of Catholic doctrine as Our Blessed Lord and Saviour Jesus Christ has entrusted the entirety of the Divine Positive Law and the Natural Law, together with all of the precepts that flow from them, exclusively to the authority of the Catholic Church for their eternal safekeeping and infallible explication, and the sole proximate reason for the decriminalized killing of babies by chemical and surgical means under cover of the civil law is the Protestant Revolution against the Catholic Church and the Social Reign of Christ the King that made possible the rise and triumph of the anti-Incarnational modern civil state. Got that? Nothing is equal to the Catholic Church, Timothy Dolan. Indeed. Not conservatism. Not libertarianism. Not liberalism. Not socialism. Not statism. Not pragmatism. Not any kind of secular " 'ism," if you will. Nothing is equal to the Church. It is precisely because the lords of conciliarism do not believe in the Catholic Faith and share a contempt for the Social Reign of Christ the King with Protestants and Talmudists and other naturalists and rationalists that the lords of Modernity in the world such as Joseph Robinette Biden, Jr., are roaming the earth with such impunity and considered as "champions of justice" by many Catholics and non-Catholics alike. 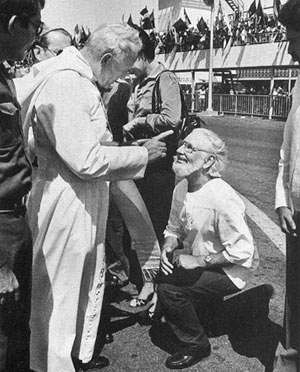 Anyone who knows anything about my writing over the years knows that, despite my abandoning my "conservative" papalotry and then my "indulterer" and "resist and recognize ways, there has been absolute consistency on the insistence that Catholics in public life who support the deliberate, direct, intentional taking of innocent preborn human life have expelled themselves from the Catholic Church. Admittedly written at a time I believed the conciliar authorities to hold ecclesiastical office legitimately, one of my articles in The Wanderer in this vein in the 1990s was entitled, "Excommunicate Them All." That article was simply one of many over the years. My current criticism of men I now realize to be pretenders to ecclesiastical office for their refusal to discipline pro-abortion Catholic politicians is nothing new, therefore. The hour is late. In the midst of apostasy and betrayal on every side imaginable, we must enfold ourselves in the mantle of Our Lady's Brown Scapular of Mount Carmel as our shield and use her Most Holy Rosary as our weapon to pray in reparation for our sins and those of the whole world, offering our prayers and sufferings and sacrifices to the Most Sacred Heart of Jesus through the Sorrowful and Immaculate Heart of Mary, entrusting our souls exclusively to true bishops and true priests who make no concessions to conciliarism or to the nonexistent legitimacy of its false shepherds, men who bay at the moon when adherents of the Talmud are "offended" but who can only issue private rebukes to public reprobates such as Joe Biden who support the mystical dismemberment of Our Blessed Lord and Saviour Jesus Christ in the persons of innocent preborn children in their mothers' wombs. May the Triumph of the Immaculate Heart of Mary come soon. Very soon! Saint Margaret of Scotland, pray for us. 28.That He completed His work on the gibbet of the Cross is the unanimous teaching of the holy Fathers who assert that the Church was born from the side of our Savior on the Cross like a new Eve, mother of all the living. "And it is now," says the great St. Ambrose, speaking of the pierced side of Christ, "that it is built, it is now that it is formed, it is now that is .... molded, it is now that it is created . . . Now it is that arises a spiritual house, a holy priesthood." One who reverently examines this venerable teaching will easily discover the reasons on which it is based.